I have a Addiction to books My favorite colors are silver and emerald green. What made you pick-up the book? > I actually watched a book trailer in Youtube (the link to that vid was way down there somewhere) so and yeah I got intrigued by that video and then I go to goodreads and read reviews about it. I was a bit shock about the mix reviews, some was positive and some was negative. So because of it I think I should read it so I have to know for myself if it's good or not. What are your expectations before reading it? > I actually have lower expectations since I've read a couple of negative reviews and they said it was very similar to The Giver by Lois Lowry. Honestly I didn't like The Giver (I just gave it two stars) and at first I thought that maybe I wouldn't like the book but at least I'd love to give utopia a second try. a. Writing Style- it was prose with a mix of poetry (somewhat lyrical) so if you adoreMaggie Stiefvater's or Carrie Ryan's style of writing you probably would love Ally Condie's style as well. b. Cassia (the heroine)- actually the heroine was not annoying and she has a strong voice. To be more specific, her character at first was a weak one and as the story progresses, her way of thinking changes and it got deeper and deeper. She actually got a good character development and she has a lot of epiphanies about her so-called perfect society and that's what I love about her. Everything around her seems perfect when you look at it superficially but when you try to analyze it deeper there society was perfect but they have no choices, no freedom at all, they're like society's puppets. d. Ky and Cassia's relationship- it builds up (it actually builds up *sorry for the repetition folks*). So yeah I just wanna rant those other books wherein yeah the boy meets girl or rather the girl meets boy and then baaaaaaam for 5 seconds they freaking love each other (like they're soulmates or idk destined for each other *gags*). Come on that was so unrealistic when authors do that, it seems they're too lazy to write the part of you know "getting-to-know-each-other" part of a relationship *coughs*. So yeah :) that was what I like about this book, I mean yeah whatever idk how to explains it but they actually have that "getting-to-know-each-other" thingy. And idk when I was reading this book I felt like I'm not reading it (if you know what I mean), I felt like I was existing inside the book. Like I was Cassia and I felt all her emotions and I empathize with her problems and I can see her world right into my eyes. So yeah I just felt that while I was reading this, I would definitely pick every choices that Cassia made. I know that in my hearts of heart I would fall in love with Ky even though it was forbidden, even though my Society says that Xander was the one I was suppose to marry. I mean there's just something about Ky that pulls you into him even if it was dangerous. Ky was mysterious and his story was what urge me to know more about him (just like Cassia). Is it that wonderful when you actually was curious to know more about a person because of his/her imperfection and rather of his/her perfection? What do you hate about the book? b. I felt that the book was idk the term uhhhhm "bridge" or "exposition/ introduction" for the other books. I mean in this book there are hints that some people outside the province were actually rebelling and there's like a war blah blah blah. But in this book the rebellion was not yet elaborated so I think that will be for the next books to come. c. I love it but the ending, I felt that it wasn't an ending at all. Idk there are so many questions that are left hanging and I felt that to be able to really judge this book you need to read the whole series and how things will be played out in the end. So yeah I need the next book pretty fast! What are other books you want to recommend with the same genre? Weeeeee! 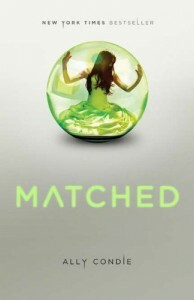 I just finished Matched and it was AMAZING. I want more!!! Joyzi: Hey have you finished the Hunger Games? Friend: No I don't want to read it. Friend: I kinda go to wikipedia and I found out it was a violent book, children killing children kinda. Joyzi: Yeah it was pretty violent. Why? Don't you wanna read something that has gore on it? Friend: Sorry friend but violence is not my cuppa. Yeah, idk what else to say, I will have an in depth review of the book on Sunday.